Very powerful course that makes you think about what your doing and the impact that you have. The way you layout the steps, definitions, purpose, and meaningful videos and experiences make it work! Love the new added content! Look forward to growing as an Influencer into the sporting community in Montana and beyond by using the principles of 3D Coaching. Feel more empowered and passionate to help change communities through the sporting culture in Montana for the Good! I am excited to full implement the 3 Dimensional Coaching into my volleyball program. I have no doubt that this method will take my girls to a higher level. I can't wait to get started. The videos were well placed to complimented the presenters during this course. The course was engaging and informative throughout and provided real life examples for coaches as well as administrators. I truly enjoyed the GENUINE and HEARTFELT way the presenters conveyed the information. Many other courses often feel like "sales pitches", but 3D Coaching never felt that way at all. I also appreciated the many suggestions for the TANGIBLE ways 3D coaching could be implemented into programs. This is a great life changing course. I would highly recommend this course to any coach or person in a leadership role. This course identified the issues facing coaches today and brought them together along with many suggestions for how to solve them. I would recommend it to any coach, those just starting out who wants a good framework for getting off on the right track as well as those who have been coaching for many years. I found this course to be enlightening and transformational in their approach to coaching. 3D coaching brought new ideas and helped me understand the obstacles that I was putting in the way of my athletes. Through their presentation I am excited to change the way I coach, and setforth a model of excellence to enrich my players. I really appreciated the pacing of the presentation, I was able to think and reflect after each section. I also appreciated the multiple voices that presented throughout, each with a little different perspective on the topic. I highly recommend this course to coaches and administrators who are seeking a foundational tool to use sports as a vehicle to teaching character. The journey through 3 dimensional coaching has inspired me to capture the heart of my athletes and I feel confident in my abilities now having strategies to coach beyond success. I am more prepared than ever to invest in this generation, to be a coach, not just a fan. Having coached for 39 years and having raised four children, two of whom are coaches, and now serving as an FCA representative contacting coaches throughout south central Iowa, I have found this course more than just an exercise in the techniques of coaching. This has been an inspiration that can affect every area of my life. I will write a purpose statement for being a father, a grandfather, a husband, a church member, and a community member. I hope to pass this inspiration on to not only my children but on to every coach that God allows me to influence. This was more than a class this was a journey into my soul. I reflected upon my past and am now excited about my future. Outstanding course. It has changed my coaching methodologies and made me a more positive coach. Wish every coach in our school would take it. 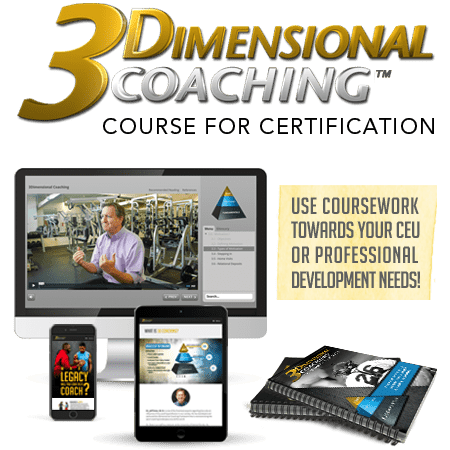 The 3 Dimensional Coaching course provides every coach with an opportunity to reflect on his or her practice while also inspiring coaches to focus on the most important, human aspects of coaching. This course opened my eyes to what more I can be doing in the lives of athletes. It really focuses your attention on the athlete as a whole person (body, soul, and spirit), and shows to me as a coach all the possibilities I have to positively impact the athletes. This makes me want to call my girls up today and get started. Its an excellent course for really digging into the purpose of why I do what I do. The coaching coach I've been looking for. Whether a brand new coach, or a coach with years of experience, this course will inspire and motivate you to re-evaluate the whys and ways we coach, refining our purpose and practical strategies in the process. This course really helped me think about myself as a coach and leader of young people. All coaches think about coaching in the 3rd dimension until it is game week and you have a lot of work to do to prepare for an opponent. This course helps you stay focused on what you know will really help your program be successful. This course helps a coach map out what to do and when to do it so it becomes part of your normal routine every week. Outstanding course. Has enabled me to change and grow as coach. Excellent Course! This is a Course that is much needed if you want to fulfill your passion as a coach! Outstanding presentation of valuable course material. As a military leader and long time youth, high school, and college coach, the information learned from this course will be useful in a number of realms. I absolutely love the content being video driven with task oriented quizzes between. ensured I paid attention. Don't why I took so long to get to this course but will review it as often as possible. Anyone who is engaged in the life of youth and/or athletes must go through this course. It is indeed transformational. I really enjoyed this class. A different way of thinking that i have not been exposed to. This was a very interesting and helpful course. Tons of information that will change the style of coach you are or wanted to become for the better. I absolutely loved this course. This will not only help coaches, but can help change a person's transcendent purpose of life and how we are supposed to interact and have relation with one another as individuals. This course has been absolutely awesome. It goes beyond the fundamentals, which is what most coaches only try to teach. I wish I would've been taught these concepts when I was an athlete, but I am encouraged that I can pass this knowledge on to my athletes in order for them to have the best experience possible. Best thing to learn ways how to improve to be a coach and becoming one as well. Online material was extremely helpful. I found most of this course applicable and helpful. It was good to do as a group and meet about weekly. It was a great course. I will use alot of the techniques I gained. Amazing course that taught me the true importance of being a coach! I enjoyed this course. I plan to use these techniques in my coaching career. This was a great course. Without a doubt this will improve any coaches abilities. This course was absolutely great!! I learned so much from each of the modules!! Highly recommend this program to any and all coaches!! This was a great course, highly recommend it for anyone entering the field of coaching. This course was incredibly helpful and inspiring. It pushed me to better myself for my volleyball program, my players, my family, and, most importantly, myself. Highly, highy recommended! This course was very informational. It really makes you stop and think about how much of an impact you have on student-athletes over the course of your career. We must coach in all 3 dimensions to fully try and reach each athlete. This course was fantastic! I highly recommend it to all teachers/coaches! I had taken a 3D Seminar, and was so motivated that I felt getting certified was an important next step to help me become a better coach. The tools I learned in this course are going to help me on and off the field, and help make the athletic journey of my athletes as positive and rewarding as possible. I have already recommended this to every coach in my organization. Well done! Fantastic. Highly recommend. Every HS and MS coach in the nation should be required to complete this course by their state association, athletic director, principal, or board of education. Even when not required or mandated, every coach should complete this training. This course taught me a lot about dealing with different types of athletes. This course was GREAT!!! it really helped me learn more about myself and what areas I need to focus on in order to be the best coach I can be! I have learned so much about myself and what I can do better in my coaching, and as a husband. Was a great coarse for not only coaching, but life in general. I really enjoyed this course. We actually used it as applied to a business and it related fantastically. It gave me confidence to continue in some of the things I had already been doing and provided insight and strategies in areas that were new. I never could have written a meaningful purpose statement without first taking this course!! Lessons directly applicable to my current season, and a foundation to put into the off-season moving forward. Great course on coaching more than the skills! very helpful for high school or college coaches. All in all, an excellent course and easy to follow along. This course allowed me to become a better coach by providing simple step by step strategies. I have been able to instantly apply what I have learned in order to help me build my program. Very informative, rewarding, and fun! I really liked this course. I wish that i would have finished it all when I first started the course. One benefit of stopping, right before the end, was to review the course, and take a second look at my notes from when I first started. My wife reviewed my answers on the 3D Coaching Certification Worksheet and wondered who "helped" me to write out the answers, specifically the Funeral Topics section. It was all me, with help from the 3D Coaching course. This course was extremely beneficial. Helped me to be objective in my thinking. I think that this was an amazing course! I learned so much and will take many things back to my team. This course gave me even more motivation to push through the difficult times as a coach because in the end it will be worth it. I loved this course because it gave me practical tools and activities to use to be a 3d coach. I also love the faith-based books 3d coaching by Dr. Duke. I think it is absolutely amazing that there is a framework like this out there for coaches and I fully, whole-heartedly believe in this framework. This is a great course for any coach who's trying to find some small edge over others. We're all good at the x's and o's, but can you be excellent in the mental and spiritual levels as well? As a brand new coach, I found this course extremely insightful. It gave me a greater understanding into what it means to be a coach. This course is dynamic, informative and cutting edge. In 35 years of coaching this course has been the most insightful of any I have ever taken. I appreciate this course and how much it expresses how we as coaches need to love and care for our players just as much as we love and care for the sport itself. It points out a lot of things that we may all already do well, but also helps us continue to learn and grow. This program doesn't just talk about coaching philosophy, but how you can develop athletes that will change their world. In just a few days this course has already impacted the way I approach our athletes and the way I am going to coach them. Coaching in 3 Dimensions is a powerful paradigm shift ... it will "Make a Difference"! I thoroughly enjoyed this course. It helped me step back and think about things happening in my personal life and my coaching career. I liked being able to take the time to complete the course and really set goals. My new purpose as a coach has greatly changed. My view on life has changed. This course changed me forever and I am grateful for that. Covered a lot of territory and turned over many stones that I had not pursued turning over in the past. A great class to take that forces you to think and get involved in what you are going to do to make changes. Very helpful and created a tremendous amount of ideas for the future. I would recommend this course to any and all ages as its not to early or to late to start changing your views toward coaching. I give this course a 5 star as it helped open my mind up so much more and realize how many coaches out there are missing out on developing the 3 Dimensional framework. I am excited to organize all of my notes and look back on a few videos. This product walks you through a process of reflection and motivation toward your goals of becoming a 3D coach and helping your athletes achieve success. There is no other "product" like 3D Coaching out there to help coaches diagnose the problems and give them the tools and motivation to coach in an honorable way and to see sports be what it was intended to be. This course has really given me the why for coaching and shows how much of a positive impact I can have on my athletes. Wonderful course! Learned things that are useful for athletes and students! I thought this was a great course and I hope I can refer back to it if needed! 3D Coaching has helped me to consistently question every move I make to ensure it is the right move for the student-athlete's and team's growth and development. It was well done and I'm glad my district helped bring this to me as both a coach and an educator. This is an excellent course that when taken will lead you to coach with encouragement, support, and love, instead of coaching with fear tactics. It is a must for the 21 century coach. This course is educational and engaging. A good course that covered many important topics of great value to Coaches. Treating others as we ourselves want to be treated is so important. The value of using these tools through sports can add so much to the real reason and the enjoyment that we can experience in sports. Very comprehensive content. Never seen anything this complete in a coaching curriculum. It goes along with the Leader in Me principles, which fits for our school district. Very good course, very informative. Easy to follow, good information, beneficial for coaches. I really enjoyed this course. I feel as though I was able to pull away at least one valid point that was discussed in each section. I took the faith version of the 3D course last summer and thought it was great but this year's updated version with new videos and other features amazed me. I can't wait to use what I've learned. Thanks for what you do! Not only is this program transformative as a coach but it will transform your life as person. It's an awakening experience for those leaders who dare to be different. I enjoyed taking part and riding the journey...this course has helped me understand my why and regain the joy in why I do what I do...Teach and Coach! Well done, thought provoking and so practical. It makes you examine yourself and all areas you can improve in. thanks for sharing that with humility!! Wow - if you coach, lead or train - and you want to understand how to shape athletes and people as 360 degree performers - then this course is a must - this is an amazing program that looks at how we as leaders can make an impact - that will endure well after the siren sounds and the stands have emptied. I loved it - it formalised many aspects of my coaching that I have been working on for years, and gives me a framework on which to hang an array ideas and philosophies, which I have been wrestling with since I started coaching! Helped me design a program to support and empower my players effectively. Wow! This course was amazing! Not only did I learn a great deal about what it takes to be a transformational coach, but it really made me think about my purpose in coaching and the impact I can have on my players on and off the field. An amazing course that has completely changed my perspective and mission as a coach. I am glad that this course, through the hand of God managed to find me, and i am so grateful i am able to be apart of this journey and the next step to come. If you are looking for ways to learn about why Christ has called you into this field, and how you can use your tools to honor Him, then this is the course for you. It will inspire you, and refocus what it is that your coaching is all about. I really enjoyed the way I could do short videos and work at a pace that fit in our busy schedules. I think it works well to not have to watch long videos because we are all super busy. But the points got made and were helpful. I wish we had time do it in groups for discussion like in the offseason, conference calls or face to face. Would like the course material at my finger-tips during implementation although I took copious notes. This is a must for all coaches who want to be better and for there athletes and for a long time in coaching. Every coach should take this course to help reinforce how to help successfully reach the hearts of our player. This course has opened my eyes to new ideas and validate some things I believed in. I loved it. Very informational and inspirational! This course should be a must for every coach at every level. This should be the main course in any coaching curriculum from high school to college and beyond. I also think it could be geared towards teachers and building a class culture. Best class on coaching ever after 27 years on the job. This was an amazing course, that should be required from all Athletic Departments. Gives a different dimension to the knowledge I have learned in my Professional Football life. Very good course all coaches should take it. Essential knowledge that coaches of all ages should learn and implement. I thought it was very interesting and I learned a lot. This course was very helpful and motivational. I would recommend all coaches and young people considering coached to take the course. I really enjoyed all of the speakers. I enjoyed this course. It gave me a new way to view my athletes. I would like more suggestions for application instead of all the quotes. This course was awesome. It helped me look beyond the X's and O's and helped me look at the relationships. I would recommend this course to other coaches because it's a good tool to for ideas of better interaction with the athletes we coach. Dimensions 2 and 3 within the course was most valuable. Learning how to effectively and efficiently impact the lives of the athletes that I coach and building life long relationships. Yes, I would absolutely recommend this course! This is a great base for coaches to be a better coach. As I watched, I took notes that will be used to help teach other coaches. The overall theme of moving your coaching style from that of fear based towards that which is rooted in love, yet yields even greater results. I would recommend this to coaches because it has invaluable information on how to take a whole new perspective on the way in which we coach. Yes, I would recommend this course to other coaches. I found the emphasis on the 3 dimensions of coaching valuable. It gave me language for something I knew intuitively. 3D coaching has been a game changer for me and direction I have taken my program. Coaching the heart of the athlete has greater results than just coaching the skill and drill. I have been recommending to everyone I come into contact with. I really like the length of the sessions. I've worked through them at my own pace and I have been able to work on them at little as time. I've greatly enjoyed ALL of the material and look forward to using more and more of this material in my own coaching AND parenting. Thank you! This course makes you really look at what you are doing in your program and what you need to change. I would recommend this course to other coaches. Make sure that you are not in season when you start because it is a large time commitment but well worth it. I recommend this course because it is a great chance to look at how you are doing things and how you could do things differently. I recommend this course because I feel that we can continue to improve ourselves to make ourselves better. All coaches should strive for this goal. All of the content was solid, however, how sport relates to our faith was the most inspiring to me. I got so many valuable things out of this course, there are too many to list. This course should be seen by every coach and made as a resource for those in clubs coaching youth sports. It provided me what I was missing and helped me highlight what I was doing. I recommend this course because it is very intuitive as far as keeping the cohesiveness of a team together. Keeping the idea of the kids first - more important than winning a game. I recommend this course because it gives great insight to helping young people understand the true meaning of life. The transformational purpose statement sesction was the most valuable part of this course to me. Before I took this course I didn't know my purpose as a coach and I was always striving for more and looking for jobs higher up (collegiate level) because it made sense to move up the ladder. After taking this course it helped me realize I am good at coaching the youth level because the Lord has given me a story to tell, the knowledge to teach, and the passion to make a difference in the lives of young athletes. Youth players need coaches to tell them that they are fearfully and wonderfully made to make an impact in this world. And that sport is not what defines these players it is their character and whom they choose to become. I recommend this course to other coaches because I know this way of coaching makes a difference in the lives of players, coaches, parents, and the sport community. I already have began recommending this course to other coaches. It helps coaches be more fulfilled in coaching by truly understanding what matters. This course was a reminder of why I started coaching in the first place. I started coaching at the youth level with 6-8 year olds and have moved up the ranks to high school. I started with the youth because of the poor behavior I witnessed from other coaches and I thought to myself, I have to get involved and teach the kids to love football not grow to hate it. These principles of 3D coaching have reminded me that I began my journey for the right reasons and I need to work harder to continue to coach the same way regardless of what level I am coaching. I think too many kids lose their love of sports because of bad coaches. I don't believe the coaches intend coach in such a way as to lose their athletes, it's just what they know. It is probably how they were coached many years ago. This course could redirect their passion for their game and the kids in a positive manner. I would recommend this coursehelps coaches understand what the real goals for coaching should be. To further evaluate my purpose in coaching was the most valuable part. I would absolutely recommend this course. I feel different and made new now in an incredible way. The person that I am naturally has both the 1st and 3rd dimension mind. Learning about the 2nd dimension and how important team cohesion, emotions, confidence and motivation are truly made me feel like an entirely new coach. I would absolutely recommend this course. This course can help even the most seasoned coaches become better at inspiring their athletes. These strategies I will use throughout the year as I coach. I will no longer coach 'JUST during my season, I will now continue to be a coach/leader to my athletes throughout their lives. For years I always thought there was something missing, but never acted on it. I figured that was the way it was. Now to realize that there is an intentional process, is a game changer in all my coaching. Not just sports. I would especially recommend this course at the community level. Volunteer Coaches are more so in need of this information. Professional coaches have some access to formal training. Volunteer coaches fly by the seat of their pants and and are the ones that set the framework before the players get to HS. This course was very beneficial to help me reflect on my role as a coach. The strategies/activities to use to coach in 2nd and 3rd dimension were the most valuable part to me. This course is life-changing. Something I have been searching for a long time. Writing my transformational purpose statement was the most meaningful part to me. This course opened my mind to ideas that I had previously not considered and the course content was excellent. The material was well presented. I have already begun to share this with other coaches. I would recommend this course to coaches because I think it would be helpful for all coaches to see a different perspective. I absolutely recommend this course!!! Sports is more than winning - it is about relationships and building Godly character!!! This course gives you an understanding of each dimension and how to connect my players to each. I'd recommend it, it really helps you fabricate a framework for how you coach. I recommend it to other coaches. It forces you to think why you do (or do not do) what you do. Learning the dynamics of each dimension was very valuable. I would recommend this course. It makes you think and challenges your coaching. It made me re-calibrate myself so I'm not just focused on winning. The breakdown of the second dimension was the most valuable part to me. I feel it gave some great examples that I can use with my own athletes to help build them as players. The athletes we coach, as well as the society we coach in, are always changing and I feel this course has incredible insight on how we coach the change. It was reaffirming that I'm on the right track with my coaching. I'd recommend this course to other coaches. It's practical. I would, have, and will be continually recommending this course. Every coach should take this course because it helps to organize so many thoughts and strategies so that they can be implemented effectively. The most valuable things to me were: The ability to articulate and implement many 2nd and 3rd dimension strategies. The research to help recognize the great power and responsibility that being a coach brings. 'You can't be a tour guide to a land you haven't visited'. I know coaches that are stuck in the first dimension, and don't understand why their kids lose games. It's so much more than skills on the pitch. It's caring for the girls before and after practice. I love the God principles and how they link to what I considered coaching 101. This course affirmed me as to what we have been doing and gave me new techniques going forward. I definitely recommend it, itgets you in the mindset of 'why' we do what we do. This course reminded me that there is much more to coaching than the physical aspect. I would recommend this course because it is easy for coaches to get caught up in a win at all cost attitude. This course reinforced what I was already doing for my team. It gave me great ideas and new strategies that I hadn't used before. It gave me a renewed sense of power and strength. I was overcome with emotion watching good coaches inspire their players. That is who I want to be as a coach. That is how I want my players to see me. I would absolutely recommend this course to other coaches. It will completely change the way they view their team, players, parents, and themselves. Every coach should watch this to break the mold of old school coaching. It was valuable to learn about how to properly treat players and the use of positive feedback. I really enjoyed seeing some strategies that would help in being a more all around coach. I believe with the way the coaching world is now that all coaches are going to have to transition into more of a 3D coaching style. The old school days of yelling and running are done. I hate to sound so cliche but I found value in the entire course. I found most value in a few things. First, building the purpose statement was a must for me; I liked the teaching content to get me there. Secondly, I chose the Plus+ certification because the material is out of my comfort zone; I learned greatly from it. Finally, I find great value in the parental video in the end. This will help me align myself with the parents, who are (at least I believe) an important part of a program moving forward. The video will help me articulate 3D coaching because this program is exact opposite of how most coaches in my area operate. I absolutely would recommend this course because of the content within it. The content in this course is not only valuable for coaches, but also for teachers, staff, or any other field that works with young people. I had highly suggested this course to my previous administrators for school wide Professional Development, but of course it was a no go because it wasn't their idea. The strategies to implement 2nd and 3rd dimension coaching were helpful. I also very much enjoyed the discussions with Jane Albright following the 301 videos. I would recommend this course. Though most of the coaches I know are striving for these things, this program provides them with tangible strategies to elevate your coaching to that level. The entire course was great! The sections 201 & 301 were incredibly helpful in packaging thoughts, ideas & practices that I have been doing and assigning & aligning them with our purpose. As an AD I will be asking my coaches to take this course. It is impactful and transformative. Very clear and concise while being complex and groundbreaking. I would definitely recommend this course to other coaches. 100%. The 2nd dimension information was very useful and the 3rd dimension information could potentially chang my life if I begin to apply it. The biggest thing that got me excited was the connection between good and great. I also enjoyed how everything was connected and supported by research. I would recommend this to other coaches because it is well structured and taught very well. The instructors made connects of the different topics, the research and real life. This course helped to put things in perspective. The issued discussed were things that I think almost all coaches think of but this brought its proper priority. I would recommend this course, it would help any coach. I wish I had this course when I first started coaching. It was valuable learning how important it is to coach not only the skill of the sport as well as coach the player as a whole looking at the player's heart and life that they are living. Connecting learned leadership principles in the work setting to sport in a structured way through the 3 dimensions. Im very appreciative of this as it reaffirms where I believe God has been pointing me towards in my personal and professional life. I most definitely recommend this course to other coaches, and already have! The most valuable part of this course was learning strategies for motivating young athletes and letting them know they are worthy young adults as well as our athletes. Many coaches already utilize, or have used , many ideas you provide. Many do not, however. This may open or reopen their eyes. It was valuable to learn about the value of the 3rd dimension involved in coaching. This course can be a valuable asset to any coach. I would recommend this course for any coach at any level. It really shows you how and why coaches must coach at all three levels. It was valuable to realize the importance of the relationship between player and coach must be more and deeper than wins/losses and performance on the field or court. I would recommend this course to coaches and teachers. It has helped me think of the impact I have on students and athletes and has made me a better coach/teacher by being more self aware. Understanding the importance of patience, joy, love, and encouragement. Yes, I would recommend this course to other coaches! I think it helps coaches focus on the bigger picture, beyond the game and competition. It was valuable to learn about treating athletes as whole people and working to develop all aspects of them as a whole person. The most valuable part of taking this course was writing my transformational purpose statement. I would recommend it as there is a lot of great information throughout the course that made me think through how I work with students. This course reaffirmed to me that the most important thing about coaching is not the physical. We can be just as productive, if not more by being nurturing and loving. It will dispel the myth that coaches have to be tough, loud, in-your-face to be productive. I'm 47 years old, I had a college coach that coached me this way. So, I have dedicated my life to being a godly coach. And this course will help me to continue to be that person and encourage others as well. I would recommend this course to other coaches because the other two dimensions are needed. The most valuable part of this course was Writing my Tranformational Purpose Statement. I would absolutely recommend this course to other coaches. This is the biggest shortcoming that coaches in America have. We need coaches to learn that sports are a tool that we use to create high quality individuals. The most valuable part of this course was Writing my Tranformational Purpose Statement. This course was full of depth and breadth. It was detailed and full of illustrations that I can use now with my players and with my own boys. This course is right on target and should be taken to every corner of every school district in the country for mandatory professional development for coaches. We must all be intentional and deliberate to ensure we get the best out of God's children as we shepherd them north through their own trials and ensure they serve each other, get the best out of each other while learning how to persevere through challenges that are part of sport! And through this process, we learn to find joy in the challenges and the journey! This course reaffirms what I believe in. I would absolutely recommend this course. People need to understand that the focus needs to not be on winning - that there is so much more to the experience. This course really made me think about why I coach and what I want my players to get out of their high school experience that goes beyond winning and losing. It is always good to do a thorough self-examination of your own motivation and goals in order to better be able to coach your players. I would recommend this course. I am excited about putting this into practice! The most valuable thing I got out of this course is the impact that a coach can have on an athlete. I want to make sure that I am leaving a positive and lasting impact on their character. This course will change your outlook on the purpose of sport. I found it so helpful in actually developing strategies to reach students in the 2nd and 3rd dimensions, and not just saying, 'Yes, I would like to have a lasting impact on my athletes.' Now, I have strategies to make an impact and address each issue within the same dimension that the issue is taking place. The most valuable part of this course was that it gave me an opportunity to reflect on my purpose for coaching and to align my actions with that purpose. I believe many coaches can benefit from looking within their programs and selves to define what they can do to truly make a difference in the lives of their athletes. The more coaches with this common vision will allow for all of us to be more successful. Learning about the depth of a 3rd Dimension coach was most valuable to me. I think I hit the 1st and 2nd really well and touch on the 3rd but didn't realize how deep it was. I would recommend this course to other coaches because I think it gives experienced coaches knowledge that we didn't have. It is good for a young coach to know where to go next beyond just the techniques. The most valuable thing I got from the course is the actual examples of different strategies to coach all 3 dimensions. I wish every coach in America could see this course. This course was an opportunity to get better! I got a couple new ideas of how to be a better coach. I also enjoyed the time to reflect on how and why I coach. The purpose statement and examples of transformational coaching were the most valuable part of this course to me. It helps for a formalized coaching strategy. I would absolutely recommend this course. I want all the coached that coach in my program to have this certification and I will find a way to pay for it for them. I loved the strategies to implement the 3Dimensional Coaching after. You not only explained WHY it is important to be a 3D coach you showed us HOW to become one:-)! Learning to distinguish between your life purpose and your goals was the most valuable part of this course for me. I would recommend it to other coaches because coaches need educationon how to run programs not based on short-term and winning results. Coaches coach, but who coaches coaches? I took away 20 'nuggets' that will help me coach more effectively. I will highly recommend to others. All of my assistant coaches will go through this course. I think all coaches should go through this program. The self-reflection of my own coaching style and approach and the creation of my transformational purpose was the most valuable part of this course for me. I would recommend this course to other coaches. I believe if you are truly green and growing you need to learn and challenge the way you coach. This course does that. The affirmation that I am doing some creative things well, and empowerment to continue to try creative 2nd and 3rd dimension things was valuable. I would recommend this course to other coaches only if they are coaches who have shown that they want to find different models for coaching. If a coach isn't ready to hear this, it will not work. If they are ready to have purpose in their work, this course could open it up for them. The 2D & 3D coaching strategies and framework to be able to make it happen was the most valuable part of this course. I would totally recommend this course. It helps frame your purpose as a coach and why you are in the profession. It's a lesson for the teacher and provides a chance to self reflect and evaluate how you are doing in your job. It creates an opportunity for self-assessment and self-awareness. I would recommend everything about this course. On a scale of 1-10, it is a 10. The psychology of working with student-athletes. I needed the instruction and ideas on how to deal with the heart of student-athletes was very valuable. The course was comprehensive and extremely helpful. This course was very valuable with some revolutionary ideas for positive change in the coaching arena. It was valuable to be reminded of the importance of our roles as coaches in the life of an athlete and how much of a difference we can make. Information on the second dimension was the most valuable thing I got out of taking this course. I would recommend it to other coaches to get a better understanding of how to coach the athlete as a whole. I would absolutely recommend this course. The sports world seems to be getting more corrupted each year and we need to fight back. This gives us some tools to do that with. I believe that this is a better way and that it can work. I learned strategies to get my players to buy into the program & me as a coach. What they learn in sports is more than wins & losses, they will fade away & be forgotten but how I treat players & what they learn about character, lasts forever. I would recommend this course to other coaches because I think coaches will get more out of kids using this & it will make our world a better place.